The American paratroopers moved swiftly through the darkness, their speed and effort keeping the bitter cold at bay. Through thick woods they’d captured earlier that day, they would soon break out into flat, open ground broken only by rows of heavy barbed wire fences. Four hundred yards across that dead space, two companies of elite SS panzergrenadiers waited for them. Supported by heavy tanks, half tracks, 75mm gun carrying armored cars and 20mm flak wagons, the entrenched SS troops possessed the kind of firepower that could utterly wipe out an infantry assault. The paratroopers had waited for the pre-attack artillery bombardment, but it didn’t happen. They waited for the two tank destroyers assigned to attack, but the LT in charge of them refused to move forward, arguing his M36 Jacksons were no match for the German armor on the other side of the open ground. A German 20mm flak half track. Cheneux was defended, in part, by a Luftwaffe light flak battalion equipped with eighteen of these deadly vehicles. Without artillery or armor, the paratroopers attacked anyway. The situation was desperate. It was 1930 hours, December 20, 1944. Christmas season in Belgium’s Ardennes Forest. The 82nd Airborne reached the battlefield only two days before after a wild drive up from France. Thrown into the path of Kampfgruppe Peiper, the men of the 82nd had no time to get oriented, lacked winter clothing and carried nothing heavier than bazooka rocket launchers. An 82nd anti-armor bazooka team covers a road near Cheneux on December 20, 1944. The Peiper’s panzergrenadiers represented the best troops left to Nazi Germany. Fiercely loyal to the Reich, they fought with tremendous intensity and determination with the best equipment in the world. Equipped with Tiger II heavy tanks, Panther medium tanks, self propelled guns and half tracks, Peiper’s kampfgruppe was supposed to lead the way to the Meuse River in the opening days of the German Ardennes offensive. Getting across the Ambleve River was a key step toward the Meuse, but furious counter-attacks by the 30th Infantry Division had stopped Peiper’s spearhead at Stoumont. To the south, at Cheneux, the Waffen-SS troops seized two bridges, crossed the Ambleve and prepared to drive on. 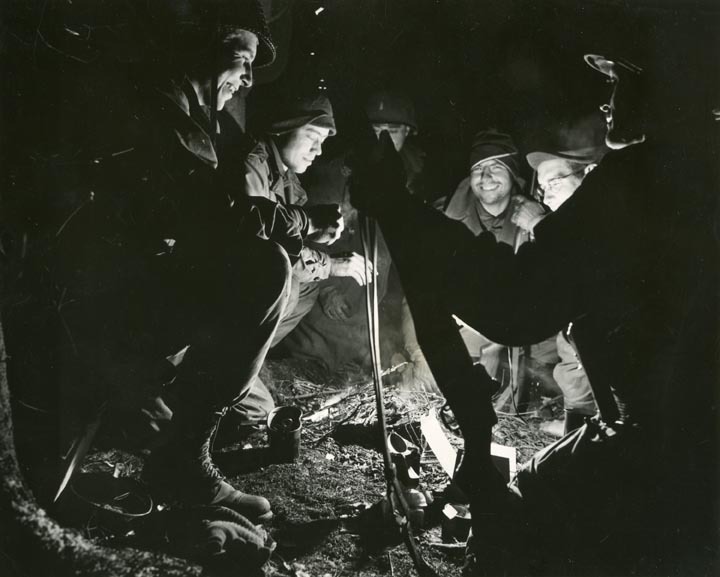 Men of the 82nd moving into forward positions on December 20, 1944. The 82nd’s 504th Parachute Infantry Regiment reached the front and its regimental commander, Colonel Tucker, realized the gravity of the situation. The panzergrenadiers had to be driven back across the Ambleve and their bridgehead destroyed. Cheneux had to be seized and the river used as the main defensive line against further German armored thrusts. The responsibility for taking Cheneux fell to the 1-504. Second Battalion had pushed to within a half mile of the town earlier on December 20, 1944, their advance aided by a captured German half track armed with a 77mm field gun, which a scratch American crew put to good use until they ran out of ammunition. Shortly after, the attack stalled and 1-504 was ordered to attack through 2nd battalion’s lines and take Cheneux in a night attack. Nothing went right at first. Bravo Company 1-504 formed the right wing of the assault, while Charlie was the left. Each company went in with four waves of men with fifty yards of space between each wave. They barely made it into the open terrain when the Germans opened fire with every barrel. Mortar round rained down on the Americans. Artillery soon followed. Struggling through the indirect, the first waves crawled to the barbed wire fences. The Germans had them zeroed. Suddenly, yellow glowing 20mm anti-aircraft shells streaked overhead, exploding among the troops. The zipper-fast sound of MG-42’s going cyclic erupted across the German main line of resistance. 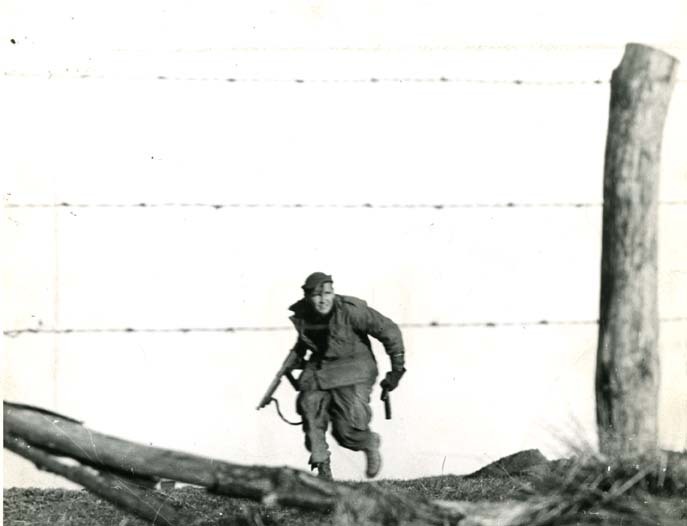 The Americans, caught against the barbed wire, out in the open without support, were cut down relentlessly. 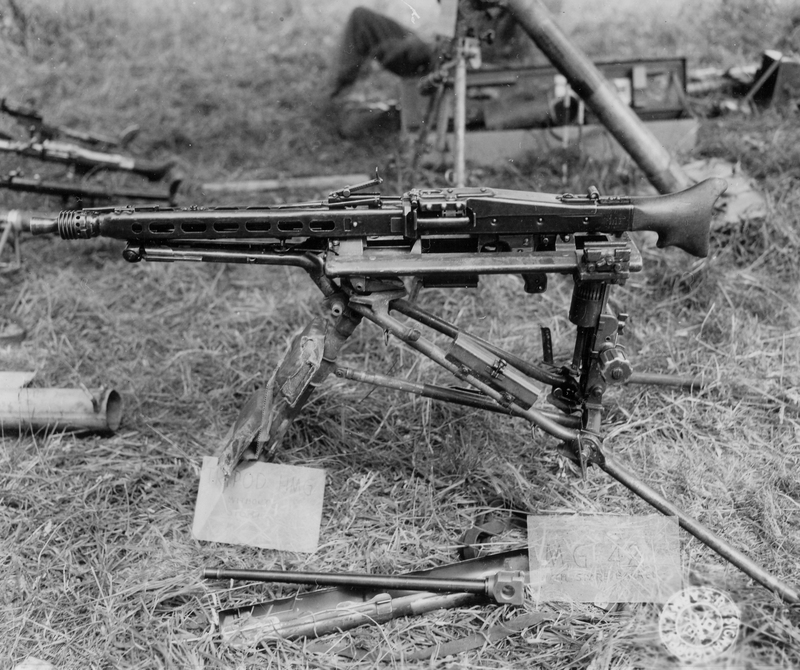 The deadliest machine gun of World War II, the German MG42. Trapped in the kill zone, the veteran NCO’s and officers of 1-504 realized they had to close with the enemy or die in the terrible crossfire. On the right, 1st platoon Bravo Company’s commander, 2nd Lt. Richard Smith and Staff Sergeant William Walsh stood up in the tracer-light night and urged their men to charge. They hurdled the barbed wire fences, 20mm flak rounds savaging their ranks. Sprinting through the fusilade, Walsh was seriously wounded in the hand. He kept going, urging his men as the MG-42’s raked through them. 1-504th’s machine gun teams suffered catastrophic losses. Five of eight supporting the initial night assault into Cheneux were wiped out by German counter-fire. 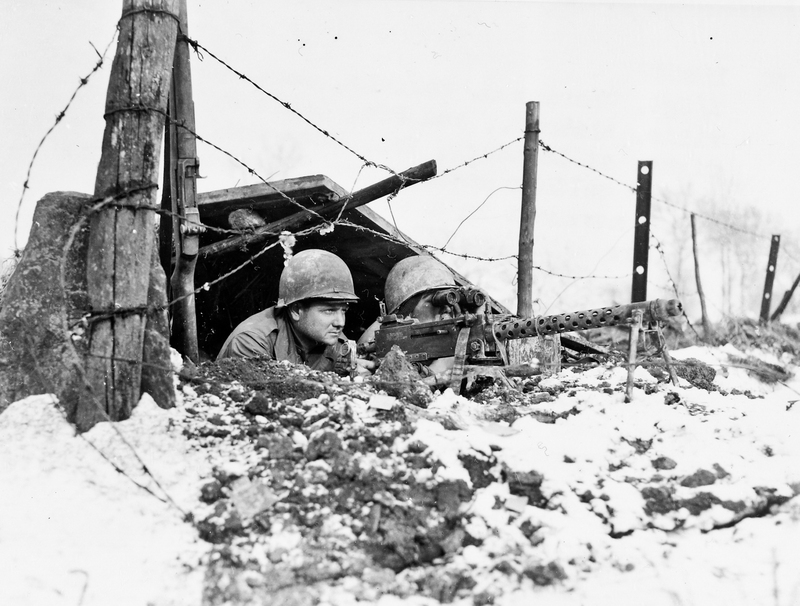 This M1919 LMG team belonged to the 82nd Airborne Division’s 325th Glider Infantry Regiment. The photo was taken at Odrimont, Belgium a couple weeks after the Battle of Cheneux on January 6, 1945. The battalion’s .30 caliber machine guns did their best to suppress the Germans, but the American gunners didn’t stand a chance in the face of so much firepower. Panzers, flak wagons and mortars concentrated on those support by fire positions and took out five of the eight machine gun crews before the night was over. That left the paratroops on their own in the kill zone. Some tried to provide their own suppressing fire while others charged forward. Ammunition ran low; the men pulled guns and ammo off the wounded and the dead to keep going. Driven forward, the first wave finally reached the German lines. On 1st Platoon, Bravo’s section of the front, Staff Sergeant Walsh had his men prep grenades for him (he couldn’t pull the pins out with his wounded hand). Holding the spoon in place, he charged toward a German 20mm flak half track and chucked the grenade onto its bed. The weapon detonated beside the 20mm gun, wiping the crew out. Other paras surged into the German trenches and foxholes, clubbing the panzergrenadiers with rifle butts and beating them with bare fists. The fighting devolved into vicious man-t0-man battles to the death. 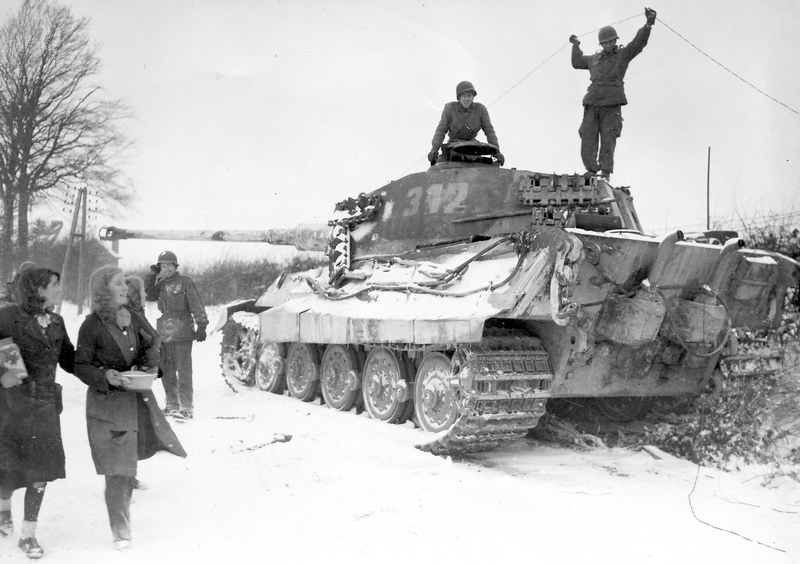 A captured panzerschrek under investigation by U.S. troops at St. Mere Eglise during the Normandy Campaign. 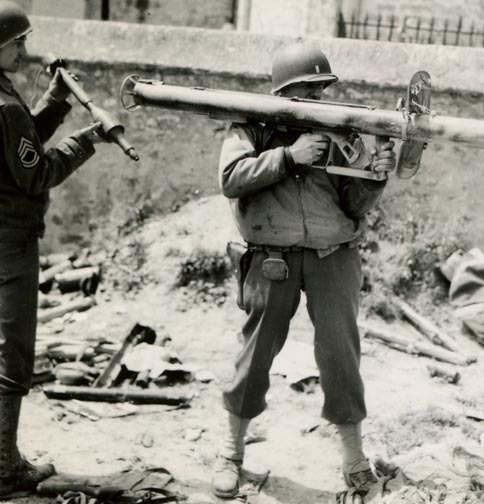 Captured panzerschreks were sometimes used against the Germans since they proved more effective than American bazookas. Sergeant Edwin Clements reached one of the flak tracks. Out of ammunition, he drew his combat knife, jumped onto the back of the vehicle and killed the three man gun crew. Nearby, Private Mack Barkley did the same, slitting a 20mm gunner’s throat then grabbed a German panzerschrek and put two rockets into another armored vehicle before being wounded in action. The fighting coalesced around the armored vehicles. The panzergrenadiers, overwhelmed in their trenches by the desperate American assault, gave ground. Twenty of them were killed in hand-to-hand fighting as the others fell back into Cheneux’s buildings. Meanwhile, the vehicle crews found themselves surrounded by paratroops willing to do just about anything to knock their guns out. Staff Sergeant Walsh was seen climbing onto a German tank and–in true Hollywood fashion–dropping a grenade on the crew from the track commander’s hatch. Others followed suit. Private First Class Daniel Del Grippo of 2nd Platoon Charlie earned a Distinguished Service Cross for knocking out an MG-42 nest, then tommy-gunning a flak track’s 20mm crew. First Platoon Bravo made it into the west side of Cheneux with twelve men standing. Walsh and Smith urged them forward toward’s the town church, only to run into another flak track parked in an intersection. Sergeant Dock L. O’Neil, who had splintered his M1 Carbine’s stock on an SS Soldier’s head, led the attack against this vehicle and knocked it out with a bazooka just as the gun crew wounded him in the leg. As the track burned, one of the Luftwaffe gunners jumped clear, only to be cut down by O’Neil’s Model 1911 Colt .45. Smith was killed soon after while leading the remains of his platoon. An hour into the attack and every B Co officer had been killed or wounded except the company commander. The sight of his men being slaughtered in the 400 yard kill zone proved too much for him. He went berzerk, suffering a mental breakdown and a few of his surviving men had to physically restrain him. Command fell to the XO, who pressed the attack forward. On the left, Charlie Company ran into multiple barbed wire fences. Every time the assault waves climbed over them, the Germans smothered the Americans with explosive shells and machine gun rounds. Stubbornly, the surviving Americans closed with the panzergrenadiers and drove them out of the foxholes–or killed them in place. As the attack neared the west side of town, Charlie’s lead elements ran into a Puma armored car equipped with a short barreled 75mm infantry support gun. The vehicle had been taking out the battalion’s heavy weapons crews, but now it shifted fire on the advancing paras. Corporal Harold Stevenson tried to knock it out with a bazooka, but the Puma’s gunners cut him down. The vehicle backed away into the night to continue the fight elsewhere in town. Charlie penetrated the town, fighting room to room with the panzer grenadiers inside the buildings while simultaneously battling the Luftwaffe’s flak tracks in the streets. The two companies of SS panzergrenadiers lost half their men and began to pull back against the Ambleve to defend the two bridges. Three hours into the fight, one of the 504th’s senior officers discovered that the two M36 Jackson Tank Destroyers assigned to the assault waves had not gone forward. Demanding an explanation, the airborne lieutenant colonel was outraged to hear a young LT explain how his tracks didn’t stand a chance against the German panzers defending the town. The LTC stormed over to a platoon of 60mm mortars and ordered the men there to start dropping rounds on the tankers if they did not move forward. Under that threat, the LT gave the word to go get into the fight. They rumbled up the main road into Cheneux, the fighting raging in chaotic clumps on either side without any clear front line remaining. As the Jacksons neared the town, a German half track roared right at them. Surprised, the lead Jackson’s crew trained their turret on the track–only to have their 90mm gun barrel smack the German vehicle. 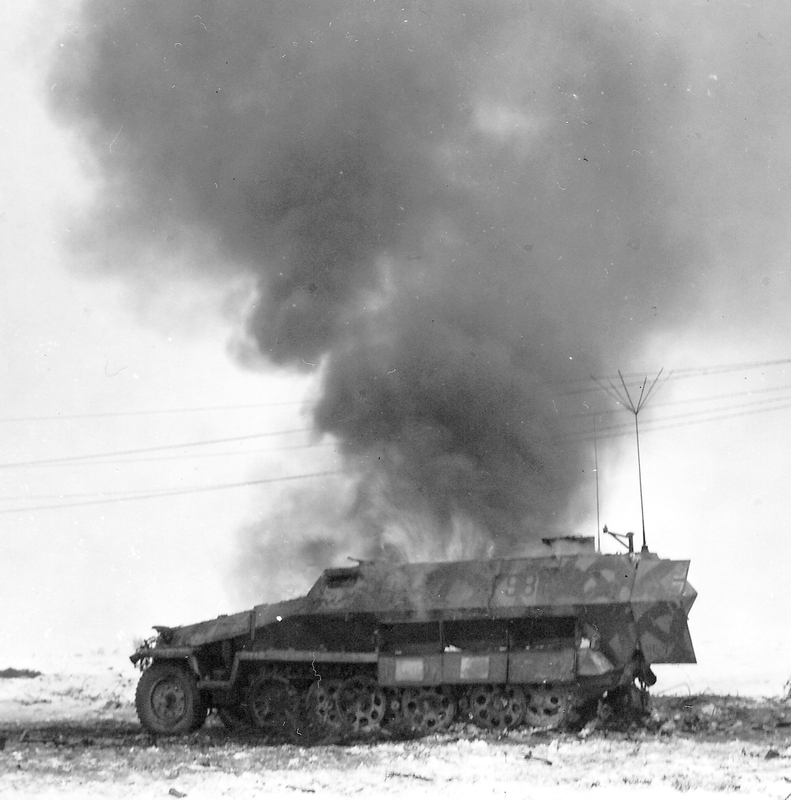 Stunned at this collision with an American AFV, the half track crew bailed out while the Jackson’s driver backed up far enough to allow his gunner to put an HE shell into the German rig. It blew up as the M36’s killed its fleeing crew. The M36 Jackson sported a 90mm gun, the largest and most powerful anti-tank weapon to be widely employed by the U.S. Army in WWII. Late that night, a few of the survivors of 1-504th’s attack reached Cheneux’s picturesque church on the south side of town. Surprisingly, it was one of the few intact buildings left, and the men approached it cautiously. Led by Lt. Howard Kemble, a light machine gun platoon leader whose men were thrown into the assault as reinforcements, the small band of Americans opened the church’s front doors and found an elderly priest presiding over a congregation of terrified, traumatized civilians. Though in the midst of battle, some of the Americans–Lt. Kemble included–entered the church, knelt beside the Belgians and prayed together with them. A moment later, they slipped back out into the fight where Lt. Kemble led the men into a bayonet charge. He was killed not long afterward by German Soldier he thought was an American. Kemble received a posthumous Silver Star for his actions. 504th paratrooper Walt Hughes at Cheneux after the night assault. By the end of the night assault, the 1-504 secured half of Cheneux. They clung to their foothold and awaited reinforcement. The next day, the 504th’s 3rd battalion joined the fight and finished the job, clearing the town and forcing the Germans across the Ambleve in bitter fighting. The Germans lost at least a hundred and fifty men, four flak tracks knocked out or captured, one Tiger II lost, two Pumas, six half tracks, a 105mm howitzer and two other vehicles. The bloody coup de main forced Peiper to abandon his only bridgehead across the Ambleve. He withdrew to La Gleize to await relief that never came. Ultimately, his kampfgruppe was surrounded and virtually destroyed. 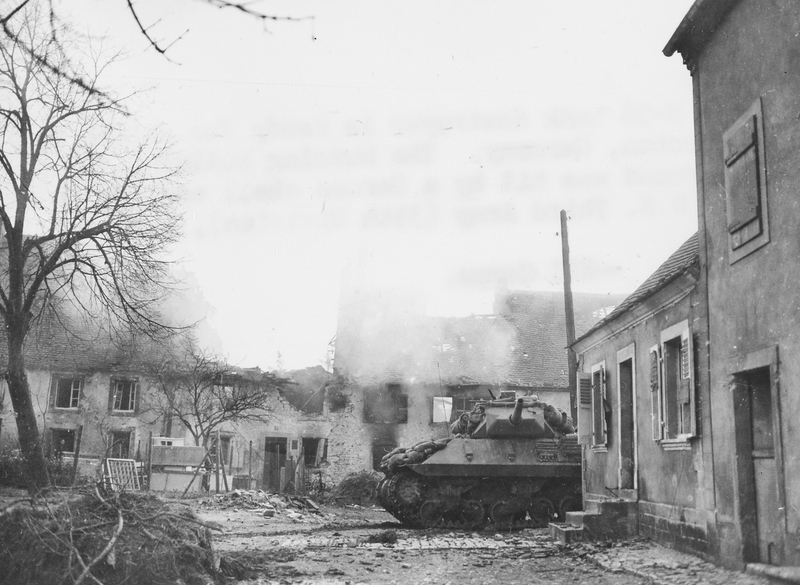 The 504th’s action at Cheneux played a major role in blunting the main armored spearhead on the northern sector of the Battle of the Bulge. That strategic victory came at a terrible cost. By the end of the first night of the Battle of Cheneux, Bravo company had twenty men standing, no officers. Charlie had three officers, forty men left. Men of the 82nd Airborne examine an abandoned Tiger II. In the days that followed the Battle of Cheneux, the 82nd Airborne Division fought against no fewer than three Waffen-SS Divisions, only retreating after General Bernard Law Montgomery ordered them to do so. Within days of that withdrawal, the division returned the offensive and played a key role in the American counter-punch that regained in January all the ground lost in December. The 504th had not just achieved their military objective that December 20th. Their furious attack against entrenched, elite troops backed up by heavy weapons and armor–succeeded against all odds because of their sheer courage, professionalism and determination. These men exemplified the best tradition of American combat arms and proved that man-to-man, the Soldiers of the 82nd Airborne were more than the measure of the Waffen-SS. The assault at Cheneux represents one of the most heroic and determined in the U.S. Army’s history. It has become part of the long and proud legacy of the 82nd Airborne– a legacy that our current generation has added to on the battlefields of the Global War on Terror. 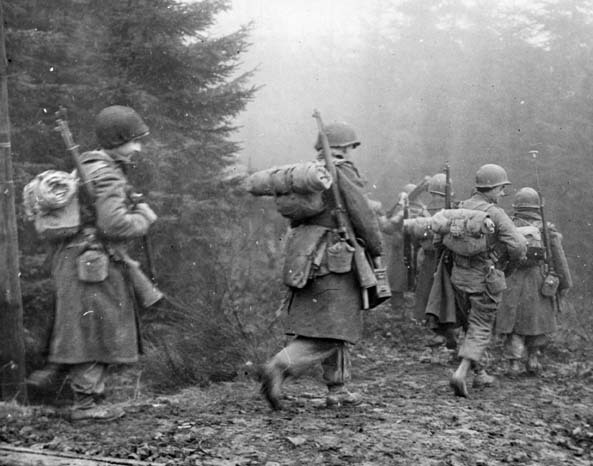 The 504th Parachute Infantry advancing to another assembly point prior to an assault on German positions near Heersbach during the final days of the Battle of the Bulge in January 1945. The 504th saw near-continuous action for almost five months following the devastating battle of Cheneux.